Small ideas go a long way! I was decorating my daughter’s cake yesterday, and thought to cut corners – time wise – so instead of making gumpaste, or crispy treats, I went for modelling the figurines using fondant. I had already made fondant for covering the cake, so it seemed like the best option. Modelling with fondant usually works, especially with small figurines, however it is not the best option, as fondant can get soft and at times not hold shape. Because the figurines I was making were mostly black – and you know how incorporating black into white fondant means using a lot of colour (how to make black marshmallow fondant on this link), and overworking the fondant, which ultimately makes it super soft – yes, you guessed it! I was struggling with those figurines which started out looking fab, but then drooped into fat and deformed figurines! Come to think of it, the time I spent trying to fix the issue took way longer than making gumpaste, or crispy treats (AKA cereal treats) ! Also, had I gone for either one would have resulted in good looking figurines, instead of my unhealthy ones that looked like they spent a lifetime binge eating! In the end, her cake looked nice, but I could have saved myself a lot of frustration! 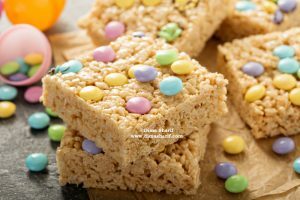 For that reason, in this post, I want to share with you all things crispy treats! What they are, what binding agents and how to make these Crispy Treats, otherwise known as Cereal Treats. Crispy treats are a fabulous medium to use in cake decorating. They are pliable yet hold shape, and can be made firm enough to carve too. They really come in handy for big figurines and structures where you need stability, like the making of walls, boards, screens, large characters…etc. There are many ways and recipes for making Crispy Treats. It is mostly mixing a sticky binding agent and the rice krispies (or any other similar cereal). This creates a sticky and at times dense mixture, that you can model into figurines or mould into blocks for carving shapes. Marshmallow is the most commonly used binding agent as it is sticky when melted but not runny so will remain firm. Liquid fondant is another option. However, and because it is not readily available in stores, it is not the most used for making these treats. 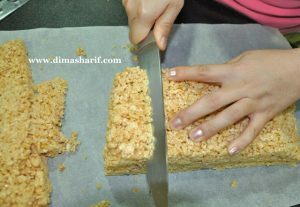 Because rice krispies look like small stones, the finished treats will have holes as well as a rough surface. The holes can become frustrating, especially if you are carving and working on details where a hole can cause deformity. So, if you are looking for a smoother finish, then pulse the krispies in the food processor before adding to the melted marshmallows. Pulsed crispies also produce firmer treats because the mixture is more firmly pressed and therefore will not crumble as much while you are working with it. Once you have made the crispy treats, and mixed them very well with the melted marshmallows, you must allow them to cool slightly. Once cool enough to handle, you can start modelling them into the desired shape by gathering and pressing very tightly. You can use the warmth of your hands to round up edges and create dents, then you can also use modelling tools to create different designs. Because cereal treats are sweet and sticky, you might need to often dampen your hands with water to avoid them sticking too much to your hands. If you want to create blocks of these treats for carving, then simply stack them – after mixing – in square or rectangular cake tins, lined with parchment paper. As you stack, press the cereal treats very firmly to create dense blocks that carve well. Then refrigerate the pressed cereal treats to firm up. Once cooled, firm and dense the blocks are ready to use for carving. To finish you will dress the shape with candy clay (fondant, marzipan, gum paste, modeling chocolate…etc). This is where you add the details to your figurine or carved shape. To dress your finished figurine, you have to ice it with buttercream or royal icing in order for the candy clay to adhere. Dressing it without the icing will cause the candy clay to fall off. Also icing your modeled figurine with royal icing ensures it does not disassemble, and fills the holes if any, but most importantly creates a smoother surface that will not break the candy clay as you dress your figurine. Once all is done and finished, allow your figurine to rest and dry especially if you have brushed any details on that can smudge when touched. Then use your figurine to decorate your cake. Wow! !That is one cute pirate cake!And thanks for the link!! Great tips. Thank you for sharing. Your cake looks fab! Wow,this pirate cake is so cute..looks yummy..thanks for sharing recipe..
What’s The Big Deal? Why Do Things Have to Change?